INDUSTRY.co.id - Jakarta - PT Bank Tabungan Negara Tbk (BBTN) or Bank BTN is ready to expand in Bengkulu province as economic growth begins to wriggle in the area because the demand for subsidized housing loans in Bengkulu experienced significant growth. "Judging from the increasing demand for outstanding subsidized mortgages, Bank BTN assesses Bengkulu's economic potential as very good. That is the main thing for BTN, "said Maryono, President Director of Bank BTN, after becoming the 73rd Republic of Indonesia Anniversary ceremony inspector in Bengkulu, Friday (08/17/2018). Maryono explained the majority of subsidized KPR requests came from civil servants (PNS) and informal workers. For the provision of subsidized mortgages, in addition to working with local governments, Bank BTN will also work with the police. "In the near future, Bank BTN is working with the National Police to provide housing for police officers in the Bengkulu area," Maryono said. Maryono further explained, on the commemoration of the 73rd anniversary of the Republic of Indonesia this year, Bank BTN got a duty in Bengkulu. This place is considered special because it has a strong historical footprint with the struggle for independence. Moreover, the commemoration of the Indonesian Independence Day was centered on the Bung Karno Exile House. "So indeed, the one who chose Bengkulu is the Ministry of BUMN. We have twice had a very historic place in the implementation of the Indonesian Anniversary, namely Gorontalo, the place where Bung Karno first landed in Sulawesi, Limboto Lake and in Bengkulu, which is Bung Karno's exile, "said Maryono. Bank BTN has carried out several activities in Bengkulu as a series of BUMN Present for the Country activities. Previously, Bank BTN had conducted Student Identification (Nusantara) activities. In this activity, as many as 20 selected students from Bengkulu Province visited Mamuju, West Sulawesi. Now, they have returned to Bengkulu and are expected to share their experiences with their friends to invite them to love their homeland. Other activities are assistance to fulfill basic needs of the community such as developing elementary school education through the construction of reading gardens, school renovations, scholarships, electrification, improvement of public facilities and infrastructure. 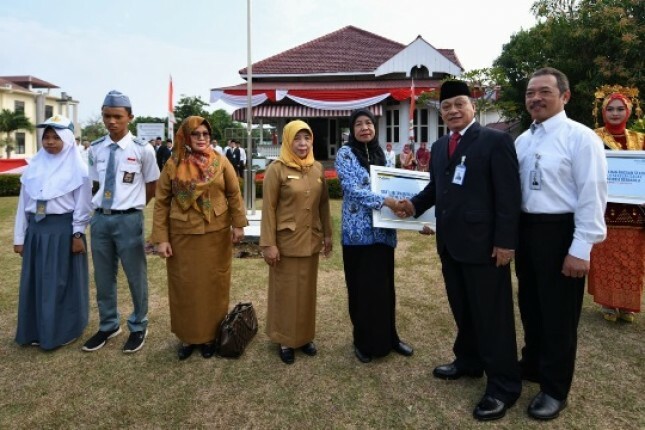 "Public facilities and infrastructure assistance is intended to maintain Bung Karno's Exile House. As a social activity of Bank BTN in Bengkulu, we have prepared funds of almost Rp. 2 billion to help it, "said Maryono. As the peak of BUMN Present for the Country in Bengkulu, Bank BTN invited the people of Bengkulu to take part in Funwalk activities around the city of Bengkulu on Saturday (08/18/2018).